In a large (10 to 12- inch) nonstick pan or stockpot, melt butter over medium heat. Stir in all seeds; cook and stir 1 minute. Add broth and beer; bring to a simmer. Sprinkle in pepper. Rinse any ice glaze from frozen Alaska Seafood portions under cold water. Turn off heat and gently add seafood to liquid, skin side down. Return heat to a simmer. Once simmering, cover pan and cook 4 to 5 minutes for frozen seafood or 2 minutes for fresh/thawed fish. Turn off heat and let seafood rest 5 minutes or until seafood is opaque throughout. Remove seafood, cover and keep warm. Remove and reserve (for later use) all but 1 cup of poaching liquid. To remaining liquid in pan, add onion, cabbage and carrots. Cook and stir over medium-high heat, for 3 to 4 minutes, until cabbage is wilted. Stir in beans. Season to taste with salt and pepper. Toss in parsley or dill. To serve, portion 1 cup cabbage stew into shallow bowl and top with a seafood portion. 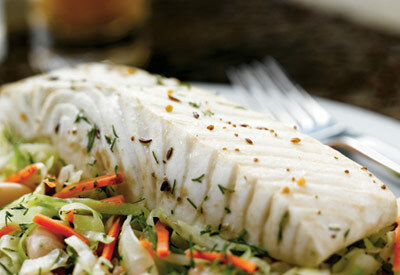 Cook's Tip: Best with Alaska whitefish varieties: Alaska Pollock, Cod, Sole or Halibut.